Ask fellow campers about "Van Buren State Park" and nearby attractions. 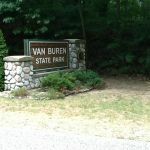 Van Buren SP is in a nice location in Southwest Michigan. The park is nice, expansive, with lots of trees, plenty of campsites, and a pleasant strip of beach, just North (within visual sight) of the nuclear power plant. Perhaps that is why the water is so pleasantly warm. The restrooms smelled of urine and were generally unpleasant to use. Campsites are nice and level, but the fire rings were built from surplus pipe and concrete, and poorly designed. A lot of smoky, poorly ventilated fires made for a heavy haze emanating from the park. This necessitated closing our windows to prevent asphyxiation from the smoke. Our 50 amp service had a bad leg, so we had to settle for 30amps. This next paragraph is directed more at the State of Michigan. You have a lot of nerve charging a daily recreational fee of $8.95 for each vehicle, especially for the camping unit itself. I have learned to accept a daily fee for extra vehicles in order to keep the traffic limited, but not for the RV. Being smacked for an additional $54 for three days did not set well. The roads are in poor shape, with patches and seams that will jar your bolts loose. And what about all those miles of coastline that are obscured by private property? There are 49 other states to visit and spend money in. Michigan is no longer on the list. We camped at Van Buren State Park in a Motorhome. St. Joseph was very nice. They have free parking. nice park although the beach was rocky and was quite a hike from the campsite. We were required to purchase a seasonal/annual permit @ $32.00. We camped at Van Buren State Park in a Travel Trailer. We have camped at most of the state parks along lake michigan. Some how we never made it here until now. Our site was grass over sand so plan on some blocks under the levelers. We ended up near the playground which the kids loved. State park play grounds are hit an miss. This one was one of the better ones. Roads are paved and can be a little tight to navigate. We disconnected the toad before entering the park. upon arriving at our site it was clear that it would be tight to back in. It was a good thing the campers across the street had not arrived otherwise it would have been difficult to back in with one shot. Verizon signal was about 50% internet speed was good but not top speed. ATT signal was a little better. We camped at Van Buren State Park in a Motorhome. walmart supercenter is about 15 minutes away. The beach is about 1/2 mile from the park. We drove each time but there are a number of trails and paths that lead to the beach area. Clean, well-maintained State Park, with friendly, helpful young men at check-in station. The campground was full on a nice fall weekend - luckily, we had paid the extra $10 to reserve a site. Paved interior roads, and mostly level dirt sites with some grass; and trees that helped with privacy, since sites are rather close together. Dog walking trail, and even a nearby Dog Beach. We would stay here again. We camped at Van Buren State Park in a Fifth Wheel. There is a dog-friendly beach area, but you have to hike over a sand dune to get to it. The regular beach area has adjacent parking, but is a short (and more level) walk from the campground. Office sells ice and firewood, but they were out of ice (for the next couple days...), and the firewood was a bit green. Check-in staffer was pleasant, we saw DNR foot patrolling the park a couple times, and we didn't experience any loud, raucous camp sites. It's mostly families and groups and, overall, a pleasant, relatively quiet place to stay. Pretty easy access, just a few miles off I-196. Overall, it's a satisfactory state park in a good location, with larger, pine and hardwood shaded sites. It's not a must-return park for us, but we'd consider it, if we're back in this area. We camped at Van Buren State Park in a Travel Trailer. Proximity to South Haven brought us to this campground, and South Haven is a lovely town to visit, with a bustling, older and renovated downtown, shoreline shops, parks, etc. Just outside town is big-box shopping, including a Tractor Supply, Wal-Mart, Meijer. Plus there are nearby farmer's markets with local fruit, vegetables, jams, honey, etc. Our second stay at Van Buren State Park was even better than the first. The park is clean, a great mix of wooded and open, the bathrooms (while older) were clean each time we visited. Lots of families yet relatively quiet. The beach is a short walk (.25 miles?) and wonderful. It's a 10 minute drive to South Haven and there is a bike trail to get you there as well. We camped at Van Buren State Park in a Motorhome. South Haven is a green place to shop, stroll and dine. The campground host was wonderful. We pulled in late. When she heard that we had signed up for a site with no electric (because we were not unhooking for the night), she told us to find an electric site that's not reserved and where we were not in the roadway. We did and thank goodness, heat index was 104. It was very quiet, and the sites were well taken care of. It's a horse camp also, and it was wonderful to wake up and see some 4 legged campers! There is no water or sewer at the individual site. We camped at Van Buren State Park in a Travel Trailer. Nice level site, clean showers. Very nice park. We camped at Van Buren State Park in a Fifth Wheel. This is old State Park which a little tired and worn. There are no septic hooks so longer stays can be tricky. However the location is awesome. Along a beautiful state park beach and just 5 miles down they road from the quaint lake harbor town of South Haven. 17 kmiles North of South Haven is the art village of Saugetuck one of the most popular resort towns in Michigan. If your looking for beautiful scenery and quaint resort towns this is it. We camped at Van Buren State Park in a Travel Trailer. This is a beautiful park: the sites are well situated. The $29 represents total cost of site plus per person for entry. The park people were friendly. We camped at Van Buren State Park in a Travel Trailer. Nicely separated sites, although sites are on sand, lucky to get a patch of grass. No real playground, only a jungle gym. Beach is too far a walk across 2 hot parking lots. Over priced when you add in the daily park fee. Beach is small and water was full of green slime. No park programs offered during our stay, only on weekends in the middle of summer! We camped at Van Buren State Park in a Travel Trailer. We reserved a grassy, level site 42 x 45 feet based on the reservation service description. Upon arrival we asked if we would have a problem with a rig our size. We were assured that big rigs use the park all the time with no problems. Our site was a patch of earth with sparse grass and what appeared to be a gravel pad. We backed in and were so unlevel our bubble was clear at the end of the level. Jockeying a little forward and a little backward failed to budge the bubble. My husband decided to just pull out and go back to the front gate. In no time we were hubcap deep in sand. The "gravel pad" was a thin layer of pea gravel over sand. To avoid making a bad situation worse, we talked to the Camp Host who sent a Dept. of Natural Resources guy to help us. He brought a shovel and boards. His comment was that we weren't in bad and he would have us out in no time. He layed two boards end to end after shoveling a bit. When my husband pulled forward as instructed the last board shot backward and bent the front bottom cap portion of our 5th wheel all to heck. They said they had no other sites except one that was "worse" than the one we were on so we requested a refund and insurance information. They refunded $29 for the entrance fee required and all but $8 of our prepaid reservation. They said that was a non-refundable fee. The DNR guy did help my husband secure the front cap of the RV so we could proceed to a commercial campground. The gentleman who led us to our site there said he had the same thing happen at the park and had to pay $150 to a wrecker to get him out. He said it happens all the time. My advice is don't go there unless you have a pop-up or tent. Compared to the Ohio State Park we had just left, this place was a dump. No more Michigan State Parks for us.l We camped at Van Buren State Park in a Fifth Wheel. We made reservations on line, having never been there before we weren't sure about the different loops. When we arrived, our site was very unlevel. After struggling to get level, we went back to the office. The young lady at the desk was very helpful and we were given a different site to move to. It's about half mile walk to the beach on Lake Michigan (or you can drive) We were one of a few motorhomes, lots of tents and popups, but we had plenty of room. We camped at Van Buren State Park in a Motorhome. Are you affiliated with Van Buren State Park ?